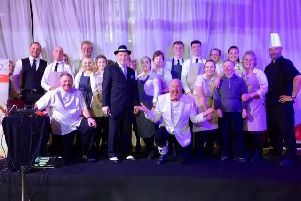 A Perfect Murder The Hall Players, Broadway Hall, Fulwood. The stage is divided into two halves. On the left is the home of John Hoskins, an accountant, and his wife Liz, two excellent performances by Dominic Swarbrick and Carol Buckley. The play opens with John addressing the audience and informing them he has murdered a girl called Carla Moorland in her flat. There then follows the scene where an agitated John, searching the newspapers and listening the news bulletins to see if the body has been found, finally confesses to Liz, that he had been having an affair with Carla and killed her after a row. Despite her fury at her husband’s infidelity, Liz does not want John to go to prison so she agrees not to go to the police, even when it means an innocent man may be punished for the crime. The left half of the stage is a police station where DI. Simmons (Paul Armitt) is in charge of the case, aided by his sergeant, Skipper( Raj Nichani). They arrest a suspect, Paul Menzies (Tom Armitt), who has admitted visiting Carla that evening to sell her insurance and he is charged with the murder. The police station then becomes the courtroom for the second half with Howard Casson as the prosecuting counsel, Nigel Parsons defending, Steve Heaton the clerk and Jane Robertson as the judge. John Nickson, who appeared in the first half as John’s work, colleague, turns up in the witness box after the interval to give a virtuoso comic performance as the pathologist, Dr. Mullings. A Perfect Murder was written by Hugh Janes, adapted from a short story by Jeffrey Archer, and as a whodunit it held the attention throughout with three twists at the end that turned the whole thing on its head. For the mystery lover, ‘a perfect evening’.